Featured on BET's Comic View, The Word Network. 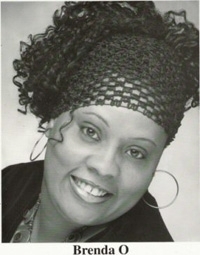 Becoming one of the east coast's leading female clean/gospel comediennes. Capturing any crowd from comedy clubs to churches. Brenda O realized the need for her gift, recognized her purpose, and acknowledged that it was indeed a ministry. Brenda O is requested often to speak at church functions, corporations, youth rallies, organizations, women retreats, parties, conferences and the like. After a hiatus of performing at comedy clubs�she is back!! The Lord is preparing her to reach the secular audience to share her testimony through laughter. She has shared stages with some of the most well know Gospel Artists in the Gospel Industry as well as secular entertainers, such as: Israel, Dottie Peoples, Vicki Winans, Dr Bobby Jones, Michelle McKinney Hammond, Kirk Whalum, Percy Bady, David Hollister, Ziggy, Jonathan Nelson, Martha Munizzi, Joe Pace, James Grear & Company, David Gough, Ramiyah, Skekinah Glory, Lil Rock, K&K Mime Ministry, Jonathan Nelson, Virtue, Cheryl Martin, and list goes on and on. When talk shows were the talk of daytime television, she appeared on every show bringing laughter. Her gift has brought her great travel experiences abroad and all over the U.S. She traveled to Korean and Japan to entertain the troops, through-out every branch of the military. April of 2007 she was selected to warm up the audience at �The Oprah Show� and was recently selected by Readers Digest, out of 5000 entries as one of the top 5 that will compete in NYC, for the �The Reader�s Digest Funniest Person in 2007� this fall. One of her more popular jokes is, she prayed, �The Prayer of Jabez�, �she asked that, �God to widen her territory�..and she gained twenty five more pounds�.